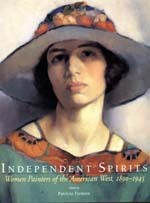 Independent Spirits brings to vivid life the West as seen through the eyes of women painters from 1890 to the end of World War II. Expert scholars and curators identify long-lost talent and reveal how these women were formidable cultural innovators as well as agitators for the rights of artists and women during a period of extraordinary development. Abundantly illustrated, with over one-hundred color plates, this book is a rich compendium of Western art by women, including those of Native American, African, Mexican, and Asian descent. The essays examine the many economic, social, and political forces that shaped this art over years of pivotal change. The West's dynamic growth altered the role of women, often allowing new avenues of opportunity within the prevailing Anglo culture. At the same time, boundaries of femininity were pushed earlier and further than in other parts of the country. Women artists in the West painted a wide range of subjects, and their work embraced a variety of styles: Realism, Impressionism, Symbolism, Surrealism. Some women championed modern art as gallery owners, collectors, and critics, while others were educators and curators. All played an important role in gaining the acceptance of women as men's peers in artistic communities, and their independent spirit resonates in studios and galleries throughout the country today. Patricia Trenton is a consultant/curator at the Los Angeles Athletic Club Art Collection. She is the coauthor of The Rocky Mountains: A Vision for Artists in the Nineteenth Century (1983), Native Americans: Five Centuries of Changing Images (1989), and California Light: 1900-1930 (1990).